In these conditions of sale: The company means Bean Bag Factory; the purchaser means the person ordering or buying goods from the company. No contract between the purchaser and the company shall exist until the company has accepted the purchasers order. The order shall be deemed to be accepted once the company has authorized the purchasers payment. It is the intention of the company that all terms of a contract between the purchaser and the company are contained in this document and in the descriptions of goods provided on the Bean Bag Factory website (www.beanbagfactory.net) for items. If the purchaser wishes to rely on any variation to these terms he/she is asked to ensure that such variations are confirmed in writing to the company before he/she places an order. To protect your own interests please read these terms and conditions carefully before placing your order. Unless otherwise specified the price quoted is the actual item cost. A delivery charge is added to the item separately with the cost displayed within the item description and added at checkout. 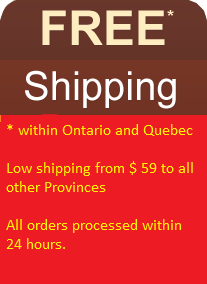 This website is only currently able to deliver within Canada and USA. Please note that we cannot deliver to P.O. Boxes. Delivery times are quoted on the basis that the product is in stock. All orders placed with Bean Bag Factory will be dispatched every Wednesday using Greyhounds standard delivery service. Orders placed via the company website can be paid with a credit card either Visa or MasterCard. Payments are handled by their secure servers at the payment stage of checkout. The company uses carriers and postal services to deliver goods and the company shall not be liable for any loss or damage suffered by the purchaser through any delay in delivery caused by such companies. As soon as the company has delivered the goods, the purchaser is responsible for them, until such time as the goods are delivered back to the company or the company’s agent, in the event of cancellation or refund. These terms and conditions shall be construed in accordance with Province of Ontario, Canada. Our Promise to you is that you will absolutely love our bean bag chair and its cozy comfort as we aim to please you with the best quality and excellent customer service. We are confident that our 7 DAY MONEY BACK GUARANTEE will ensure that you are perfectly satisfied in case you change your mind. All orders placed with Bean Bag Factory are covered by a 7-day money back guarantee. If within 7 days of receipt you are not satisfied with your order, you are entitled to an identical replacement (if in stock) excluding all delivery costs providing the goods have not been used and are packaged in their original condition allowing us to use it for resale. Please note, we individually check all returns and if we consider the fault to be as a result of self-damage, then a refund will not be given. Where the purchaser is returning goods then the refund shall comprise the original purchase price (not including delivery costs) less a re-stocking fee of 10% of the purchase price.